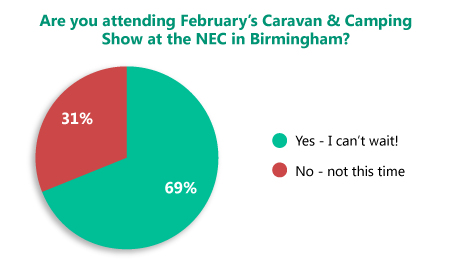 Last month we were interested to know how many of you were planning on going to the Spring Caravan & Camping show 2014. The Spring Show is one of the most popular events in the industry calendar; it’s the place where manufacturers, dealers and retailers congregate to showcase the latest products, services and exclusive offers. This year’s Show was the busiest ever, attracting a record 84,205 visitors – but were you one of them? We’ve totted up the votes and can reveal that a massive 69% were planning on heading to the NEC. It’s seems awnings are a hot commodity this spring! Be nice to have the show at Excell it’s a long way to travel from kent,unless we can camp on site,we can be fresh as a daisy,and get in whe,n the doors open we can pop up on the train to London.What a about the show being alternateing between London and NEC ? As we do every year we attended the Caravan Show at the ssec Glasgow but this year everyone in our group thought it was a total flop. The majority of the show was allotted to Motorhomes or static caravans we were yoying with the idea of having a serious look at a new two berth caravan but there was nothing new at the show, it was a complete waste of money between entry charges and car park charges. I do not think any of us will be back.